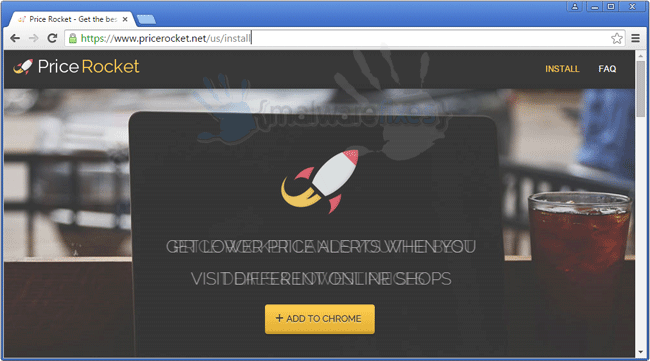 Price Rocket is a malicious program that can interfere with your Internet browsing activity. It will show pop-up ads, coupons, deals, and discount for irrelevant products. This commercial contents coming from Price Rocket affiliates may be useful to others, but worthless to many who are not inclined to online shopping. Some computer users who get in touch with Price Rocket deemed it as part of virus activity. In the presence of Price Rocket, it attached itself to known browsers like Internet Explorer, Chrome, and Firefox without user’s consent. In short, instant appearance of Price Rocket coupons or ads comes as a surprise, especially if user has no involvement in the installation. Normally, freeware is the main source of this adware. Free programs are packed together with Price Rocket so that both runs in single installation process. What user don’t know is adware is being installed, not only the preferred software. Price Rocket coupons and comparison intends to give online shoppers a tool to balance on online deals and get the best offer. Coupons and savings are also provided as a pop-up and will appear when user is browsing online shopping sites. If you feel that Price Rocket is not in any way helpful, we suggest removing it from the computer. It may have other purpose like recording some of your browsing data that may lead to identity theft. 3. Look for and remove Price Rocket entry. If not present, look for any suspicious labels that was installed recently. 4. It searches for presence of harmful programs, plug-ins, add-ons, or any data that were found malicious and linked to Price Rocket. You need to Clean all items detected by this tool. After the previous scans, you may have deleted Price Rocket from the affected browser. This next step will ensure that no more module of adware will be left on the browser. This free tool scans and checks the browser for unwanted add-on and extension, and if found, Avast Browser Cleanup will give you a report and suggestion. 4. Avast Browser Cleanup will confirm before it permanently deletes the add-on. Please click Yes to proceed with the removal of Price Rocket on the affected browser.